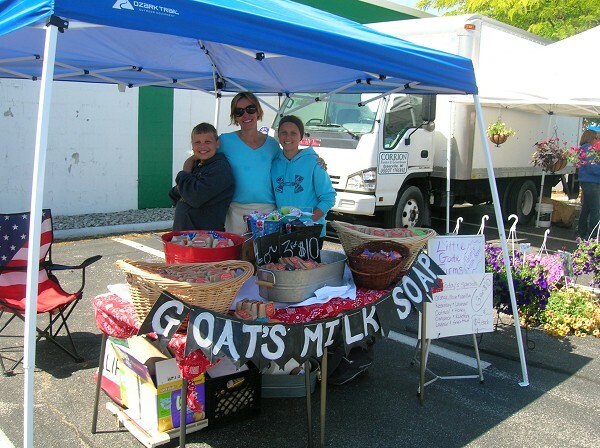 Thomas, Jill, and Grace Buchholz offer a variety of goat soaps. The first time shopper at the Downtown Bay City Farmer's Market found what she was looking for, and them some. "I found exactly what I wanted," she said. Before her shopping trip was over, the Bay City resident not only stocked up on peppers and asparagus but baked goods, tomato plants, and flowers. Now in its second week, the market, located in the parking lot at Sixth Street and Washington Avenue, is home to six vendors, right now. But Jan Rise, market master, says as the season progresses, more and more vendors will be showing up to sell homegrown fruits and vegetables. Those stopping by now, won't be disappointed with the selections. "There is something for everyone," said Rise. Tiffany McDonald, and daughter Brooke, 12, were offering homegrown strawberries, beets, and asparagus, along with all types of herb, vegetable and flower plants. Other vendors are stocked with s selection of tomatoes, garlic, onions, raspberries, strawberries, cucumbers and green pepper, as well as fresh baked goods. Out of the ordinary is goat soap from Little Gate Farms in Pigeon. Manned by Jill Buchholz, daughter Grace, 10, and son Thomas 9, the trio is offering of soap made from goat's milk, in all sorts of wonderful aromas. Tiffany and Brooke McDonald show off their wares at the Downtown Bay City Farmer's Market. This is the group's first time at the market but says they will be back. Coming back for her third year, Kate Biskupski of Bay City is selling her line of fresh salsa and pepper jelly, made mild to hot, hot - with Michigan grown products. In fact, Biskupski gets many of her ingredients from other vendors at the market. Biskupski says her best seller is something she calls Cherry Bomb, a jelly with a sweet beginning and a mildly spicy finish. "You can use them as salad dressings," she said. "On shrimp, in a stir fry. They go great with any protein." Check out her selection at http://www.northofthesouthernborder.com/menu.html. For the sixth year in a row, the market is taking part in Double Up Food Bucks that matches every $2 spent on SNAP-eligible foods with a Bridge Card up to $20 per day. "It's a USDA initiative to get those with Bridge cards or SNAP to buy healthy foods," said Rise. They can come every week and get $20 worth of Michigan fruits, vegetables and eggs and meat when we have them." The market is open from 10:a.m. to 3:30 p.m. Thursdays through Oct. 31. But, says Rise, it's best to get there early because some items sell out. From mild to burn off the tongue, Kate Biskupski has a line of salsa and pepper jelly for everyone's tastes. The Downtown Bay City Farmer's Market has something for everyone.